First of all, my apologies. 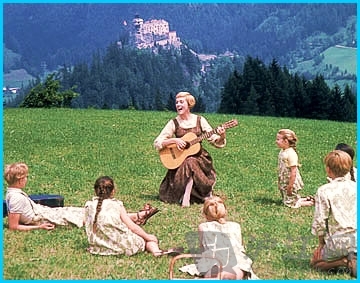 You’ve read the title of this post, and now I’ve got you singing “Do Re Mi” (at least in your head, if not out loud). And it’s going to be stuck in your head all day. And possibly tomorrow. Whoops. But when we sit down to talk over this question of gender in our Christian walk, it really is a good plan for us to “start at the very beginning, a very good place to start.” (Thank you, Rogers and Hammerstein.) Because just like A-B-C, 1-2-3 or do-re-mi provide the building blocks of literacy, numeracy and music learning, Genesis 1-3 is the foundation on which our Christian understanding of gender is built, among many other important concepts addressed by these three key chapters. Oh, you once thought it was oh-so-simple, didn’t you? Adam and Eve swanned round in a perfect world with docile animals and beautiful gardens, always perfectly concealed behind bushes so they would be inoffensive in the children’s Bible pictures, at least until the advent of Fig Leaf Fashions and a later venture into the fur trade. Then that lousy snake poked his nose in where it wasn’t wanted, and it all went downhill from there. Kids’ Church Curriculum 101. As you’ve got older, it’s become a little more complex. You’ve read other bits of the Bible that touch on this story in ways you’re not quite sure you really understand; perhaps other Christian books (good or bad) have come across your path; and quite likely, you’ve heard a sermon or two about this. It may have depended on where you were at in life and faith at the time, but some of the things you heard or read sat okay with you; some of them felt a bit uncomfortable but you might have had difficulty pinning down exactly why; while others may have had you feeling absolutely hopping mad or mutinous. One thing I’ve noticed as I’ve read around this subject over the years is that there are a lot of big leaps of logic and theology made by a lot of people. Let’s not beat around the bush (Adam and Eve might be hiding demurely behind it!) – some of what you might read or hear out there is poor theology, directly harmful to the way men and women view themselves and interact,and has no genuine biblical basis at all. Remember when Jamie Oliver was known as the Naked Chef? I can recall a time when I assumed this was not a show that ought to be broadcast during a “family” timeslot! I was fairly relieved to discover it was not the chef who was naked, but rather, the food. By that, Jamie Oliver meant that he was stripping the recipes back to simple flavours and techniques, without the pretentious elements of most celebrity cooking at the time. So, it’s time for us to take the “Naked Bible” approach. Over a few posts, I want to strip these texts back. Find out what the Bible is really saying about it. Explore whether there are some ideas that might be fairly common out there which we really need to consign to the old circular filing cabinet (that’s the rubbish bin, if that’s not a phrase they use where you come from!). Try to get a handle on what the early readers of Genesis might have understood and the author’s intent. Tease out what God had in mind when he “created them male and female.” Discover the beauty of God’s design for male and female. So grab a Bible, sit down and have a read in preparation for the discoveries we’re going to make together in these next few posts. If you’ve got questions you’d particularly like to see answered in these posts, then leave a comment below or send me an email to godsdesignperth@gmail.com. Find post 2 in this series on Genesis 1-3 here. My take is John Walton’s recent work on this revolutionizes how one can understand these texts, even when one does not necessarily agree with all his points. I also have some ideas I have not seen elsewhere. Hi Don, I’m not familiar with that work. Could you tell me the title, and perhaps a little more about his premise? John Walton wrote for common people (like me) “The Lost World of Genesis One” and more recently “The Lost World of Adam and Eve”. He also has some scholarly books that are heavier reading and go into a lot more detail. I’m listening. I always say the foundation for egalitarianism is not in Gal 3:28, but in Gen 1, 2 and 3. I agree. I think Gal 3:28 is more like a culmination than a foundation. Understanding what God’s plan was for men and women in a perfect world, and how the Fall disrupted that is key.